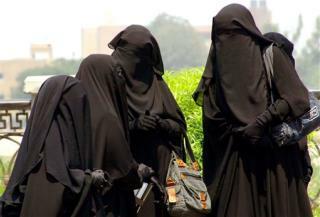 (Newser) – France’s parliament is making noises about banning head-to-toe Islamic women’s dress such as the burka and niqab, the Times of London reports. Opponents called the the dress “a moving prison” and a “tomb," and say it's cropping up more in big cities. If the burka is “contrary to republican principles,” a minister said, “naturally parliament would have to draw the necessary conclusions.” The nation banned headscarves from public schools a few years ago after a controversial debate. The burka helps evade police and hide, I myself used the burka to hide and live in clandestinity, and to cover my frogman gear when I escaped from Dubai. Take away one freedom for another. That just doesn't make since to me. People should be allowed not forced to wear anything they like. My husband doesn't like for me to wear certain things in my closet so I don't. How is that any different than what these women are doing. On the other hand I'm sure some women are forced to wear them instead of asked to wear them... And of course I don't believe that is right.